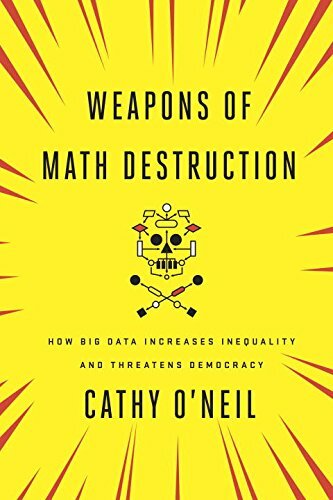 For three feverish months late last year, I worked with a extraordinary mathematician and person, Cathy O'Neil, on her book Weapons of Math Destruction. It's coming out this September, just in time for the political season, and I think it could have an impact on the debate. 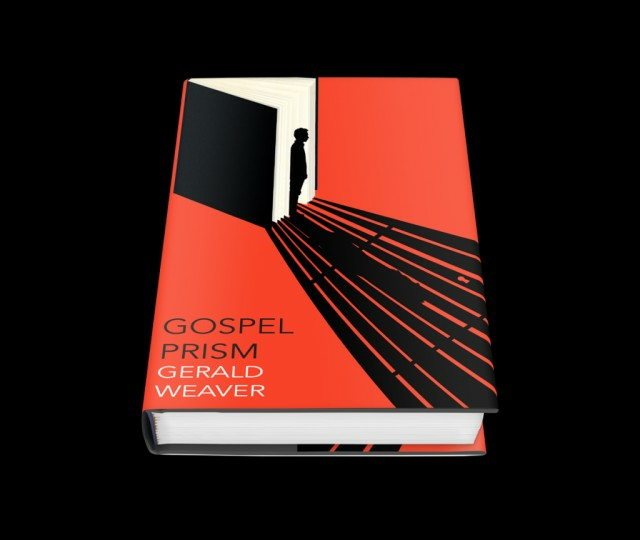 More details on the Amazon page, where it's available for pre-order. Cathy's book looks not only at what the Numerati get wrong, but how poisonous algorithms gain immense scale, become accepted as "truth," and generate destructive feedback loops. I had great fun working with her and recommend her book. One of the reasons I haven't been posting recently is that I've been working on different book projects. I'll discuss the most recent one, another novel, in another post. As nearly everyone in the entire world knows by now, we had some snow over the weekend. A lot of snow fell, it was windy, most people stayed indoors, and a few ventured out to make good on their investments in 4x4 trucks. Maybe this storm brought a few more inches of snow than in previous years, but it was basically the same experience. 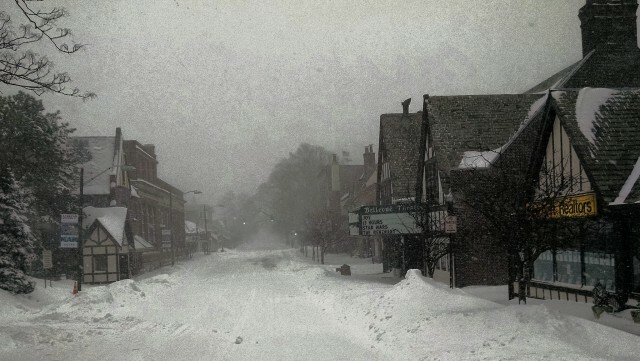 I walked into a deserted Upper Montclair and took a few pictures, which look identical to pictures from past years (except for the movies showing at the Bellevue Theater) Yet the media made a huge deal about the storm, as always. Storms are like annual exams. Mayors and governors get a chance to show that they have their act together, or not, and we all grade them. Aside from that, nothing changes. Forty years ago, I was a student in Spain. 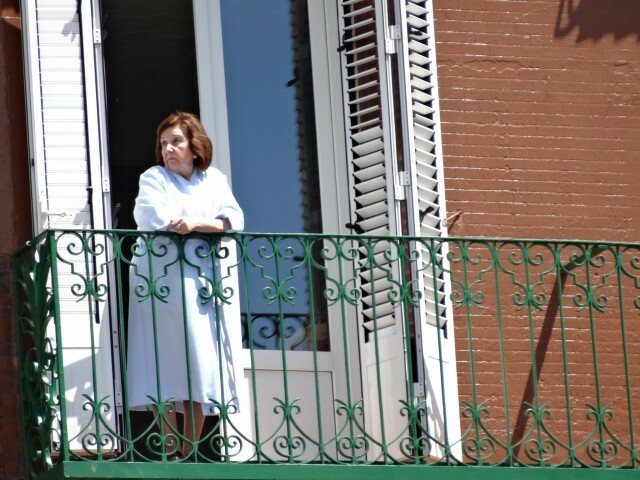 It was the year Francisco Franco died. I didn't know that I was going to be journalist, but I was interested in history, and especially fascism, which seemed at the time to be transitioning from current events to the realm of history. Hitler and Mussolini had provided military support to put Franco into power during the Spanish civil war (1936-39). Later it became clear that Franco, for all of his faults and cruelty, was much cagier than those two. He had a sharp survival instinct. He "supported" the Axis during the first years of WWII, but told Hitler, with much regret, that his country was too devastated from its civil war to allow the Nazi army to pass through Spain and close Strait of Gibraltar, shutting off the British from the Mediterranean, and the vital oil from the Middle East. Hitler was incensed. He went back to Germany, fulminating to his aides that Franco was a damned "Jesuit." He then turned to Plan B, his disastrous invasion of the Soviet Union. So you could make a case that it was Franco, perhaps more than Churchill or Roosevelt, who won the war for the Allies. As the war progressed, Franco was smart enough to lean away from the Axis powers as they began to lose. In the 1950s, he took advantage of Spain's strategic position, the same one that interested Hitler, and forged a strategic embrace with the United States. By the time I was there, I was listening to Phillies games on the radio station from the American army base outside of Madrid, in Torreon. Franco was the last '30s-era fascist, and he died of old age. I went with a couple of Spanish friends to his funeral. It was in a desolate monument in the mountains, Valle de los Caidos, built in the '40s by prisoners from the losing Republican army. When his casket was carried through the crowd, thousands of arms raised in a stiff-armed salute, and the multitude sang Cara al Sol, the hymn of the Falange, the party of Spanish fascism. I thought they were saying good-bye, and that fascism was dead. I was convinced, like many of us when we're young, that progress was linear. A couple of years later, I was living in Quito, Ecuador, teaching English and writing fiction. And I remember wishing that I could have lived in Europe between the wars, when an entire continent was sliding toward catastrophe and everything seemed so much more interesting. The 1970s were dull. We had energy crises, stagflation, the Patty Hearst kidnapping, and some terrorists who hijacked planes. Tame stuff, by comparison. In late October, I went on a bike ride with my Spanish friend. 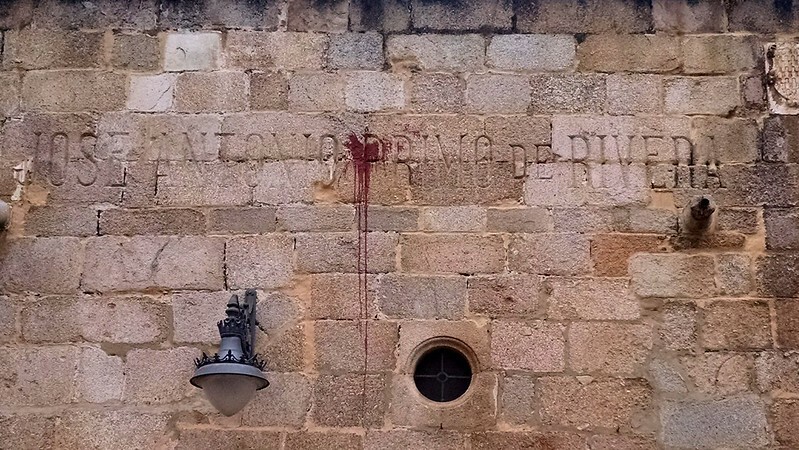 In the city of Caceres, I saw the name of Jose Antonio Primo de Rivera, martyred founder of the Falangist movement, etched into a church wall. This was banal in the '70s, but surprising to see forty years later. As you can see, fresh blood-colored paint is dripping from his name. I've been tucked away the last few months, collaborating on a book project, and writing about 1,000 words a day, and ignoring this blog. The book deals with the kinds of mathematical models I wrote about in The Numerati, the ones that predict us as shoppers, voters, patients, and so on. This one is a different angle, though. Still, it was fun to return to that world. I went to my agent 10 years ago this November, right before Thanksgiving of 2005. We were discussing another project, but I mentioned to him that I was writing a BusinessWeek cover story about the coming mathematical modeling of humanity. Lots has changed since that time. I was in Toronto, on the first weekend of my book tour for the Numerati, in September of 2008. Negotiations to rescue Lehman Bros fell through, and lots of radio and TV shows were more interested in the collapsing global economy, and Barack Obama's race toward the White House (and the emergence of Sarah Palin as a national celebrity), than they were in my book about the mathematical modeling of humanity. Since then, Big Data has become familiar to the point of fatigue. Anyway, with the project completed (save some editing), I'm taking off for a bike trip to Spain. My friend and I will tour the region of Extramadura, the dry Western lands that gave the world its hard-scrabble conquistadores, Hernan de Cortes and his coarse copycat, Francisco Pizarro. We'll end up in Seville. I'm going to be reading Siempre Nos Quedara Madrid, by Enrique del Risco, as recommended by my friend and neighbor, Alexis Romay, author of La Apertura Cubana. I'll have it on my phone. Wouldn't want to add the weight of a paperback. For years I bowed to a taboo: Never edit your own Wikipedia page. I thought to fiddle with your own page was a bit pathetic, the ultimate selfie. But it also seemed to go against the crowd-sourcing ethos of Wikipedia. It introduced an interested party into the sanctum, as if Proctor & Gamble covered itself in the New York Times. A few people had very kindly written a bio for me. It was a bit thin and haphazard, and its lack of citations led Wikipedia to post a warning banner atop the story. It didn't meet the site's standards. I went onto the talk page in 2008 and asked for advice on how to improve the post (and remove the banner). No one responded. For the next six years, I largely ignored my Wikipedia page. Then I got a call from Dan Cook, an old friend from BusinessWeek days. Dan now works with Pete Forsyth at a consulting company, Wiki Strategies. The heart of their business is what they call "ethical editing." The idea is that a Wikipedia page is the online front door for countless people and businesses. It is in both their and Wikipedia's interest that the page be accurate and complete, with citations. Of course, Wikipedians also want to keep self-serving pap and propaganda off the pages. But even the subjects of Wikipedia articles should share that goal, because to turn the online encyclopedia into a promotion engine risks undermining their own reputation--especially if Wikipedia editors and readers catch on. Dan offered to help me improve my page. This meant finding citations, organizing the different chapters of my life, and--most importantly--explaining on the talk page what we were up to, and asking people to point out any problems or shortcomings they saw. So now there's a better bio of me in Wikipedia. I don't own it or control it. But I contributed to it. When I was a senior at college, at the University of Wisconsin, the athletic department paid me $5 per hour to teach Spanish to athletes. Some of the athletes, especially those who traveled a lot, needed help to get through their foreign language pre-reqs. Every week, I’d set up appointments at the library with runners, swimmers, and football players. None of them, as far as I could tell, was getting much out of Spanish. Then I got the basketball captain, a point guard named Bob Falk. He had been one of Madison’s greatest high school athletes, all-state in both football and basketball. He’d gone to Kansas to play basketball, but didn’t like it there, and transferred back home to the mediocre Wisconsin team. Unlike my other students, Falk was progressing nicely in Spanish. He just needed help working his way through short stories by Jorge Luis Borges. My roommate, who tutored the athletes in math, got a tougher assignment. 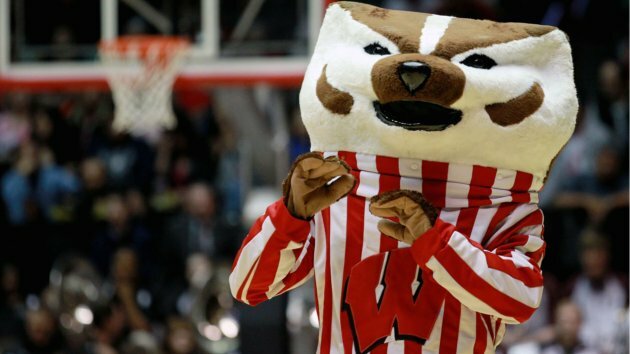 Wisconsin had just landed a blue ribbon recruit from Maryland, a silky smooth 6–8 forward named James “Stretch” Gregory. Stretch, they hoped, would lead the Badgers toward the big time — appearances in the NCAA tournament, maybe a national championship. That was the dream. Stretch needed help in math, lots of it. The season was at stake, as was the dream of a blue-chip program. The athletic department gave my roommate a blank check. The more hours he could put in, the better. Stretch’s eligibility hung in the balance, and so did Wisconsin’s future as a blue-chip program. Or so it must have seemed at the time. So the two of us, from our tables at Helen C. White library, had a role with that team. Our two players, Falk and Stretch, certainly had their moments. Stretch, with 17 points a game, led the team in scoring. And in mid February, Falk hit a game-winning jump shot from the deep corner to shock the reigning champions, Bobby Knight’s Indiana team. But then Stretch had a minor brush with the law, and had to take part in a program for first offenders. This appeared to distract him from math, which put my roommate on the hot seat. A young assistant coach from that team, Bo Ryan, also branched out. He won Division III championships at UW-Platteville, before moving to Milwaukee and finally, Madison. Ryan has since lifted Wisconsin basketball to an elite program. The dream from those days when we were tutoring has finally come true. I wondered, as Ryan watched Josh Gasser and Sam Dekker dart past Kentucky defenders, if he images of Falk and Stretch and that improbable win over Indiana popped up in his memory. I’d like to think that today’s Wisconsin basketball players might still be grappling with Borges’ Spanish or algorithm design — in short, taking advantage of the academic side of college. But I’d also bet that if a big star were on the verge of losing academic eligibility, the team wouldn’t rely on the time and tutoring skills of a single engineering student. 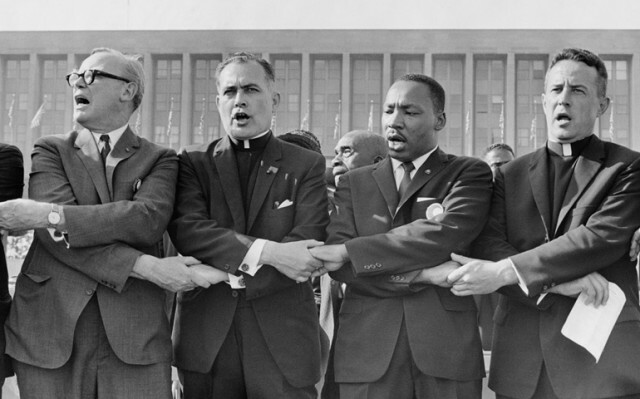 Harris Wofford, Father Hesburgh, and Martin Luther King, jr. 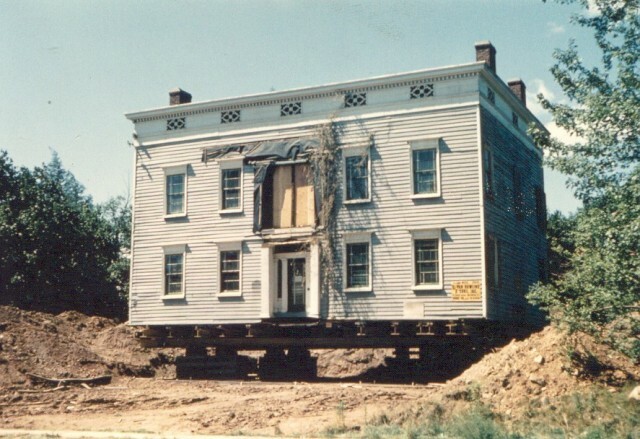 When I was in high school, I was lucky enough to live down the street from an extraordinary family, the Woffords. Harris Wofford, who would much later become a senator, had played a big role in the civil rights movement, as a friend and ally of Martin Luther King, jr., and an advisor to President Kennedy. One of the people he mentioned often, and with reverance, was Father Theodore Hesburgh, president of Notre Dame University for 35 years, and a great social activist. Father Hesburgh died in late Feburary. If he had died in the '80s or the '90s, when more people were aware of his extraordinary work, his death would have been front-page news. But Hesburgh made it to 97, outliving many of his headlines. Wofford, who turns 89 next month, traveled to South Bend for the wake, and spoke with The National Catholic Reporter about Hesburgh. Here's the interview. Wofford also wrote a wonderful piece about the Selma march for Politico. It focuses on a crucial decision that King faced on the day of the second march. The entire movement was about giving every American fair and equal treatment under the law. So what should King do when he has thousands of eager marchers ready to go--and he receives an injunction from a well-meaning judge, ordering him to postpone the march until safety can be guaranteed? Read the story. 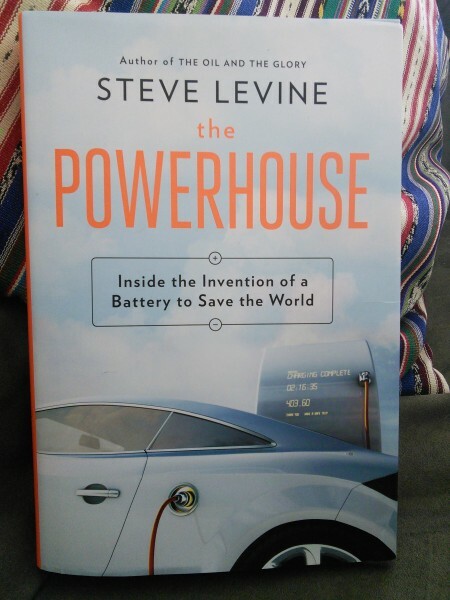 I just raced through Steve Levine's The Powerhouse, a gripping, in-depth history of the race toward world-changing battery technology. Levine, a classmate of mine and briefly a colleague at BusinessWeek, has written books about Russia and oil. Now he turns to a technology that could spin the oil market upside-down--and Russia, too, for that matter. If electric cars go mainstream in the 2020s--still no sure thing--it will convulse global energy markets and the world economy. Levine looks at the race toward battery technology from inside Argonne National Laboratory, west of Chicago. But his reporting extends to South Korea, Japan, and China, where efforts to come up with superbatteries are all racing ahead. I knew almost nothing about battery technology and learned a ton. My one disappointment was that he didn't take us into the future, to see how the story is likely to play out. But Levine is a journalist, and a good one, but not a futurist. The story of how next-gen batteries will change the world is yet to be written. When it is, The Powerhouse will serve as a wonderful prologue.